It doesn't take much to tickle my funnybone some days. This was one of those days I guess. This picture just did it for me. I laughed right out loud. Yet, there is so much I love about this picture. 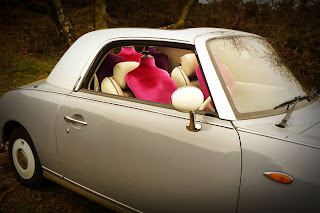 I lurve the hot pink mannequins and I think the car is very cool. Still, I laughed.